Need a remodeling service for your Shower Enclosures in Rancho Bernardo, CA? Rancho Bernardo’s home for quality custom cabinetry since 1980. Custom Cabinets in Rancho Bernardo, CA for the bathroom and kitchen remodeling are our specialty. 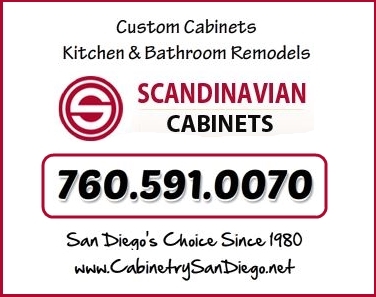 There’s good reason why Scandinavian Cabinets has so many happy clients throughout Rancho Bernardo, CA. What local areas in Rancho Bernardo do we service? We proudly service every city and zip code in San Diego County / Rancho Bernardo, CA. Are you having a difficult time in choosing which type of material to use for your shower enclosure, San Marcos CA? Well, you might be interested with marble. In this post, we provide some good reasons why pick this material, so please read on. It can be tempting to go for cheaper materials for bathroom renovation most especially if you are in a tight budget. There is nothing wrong with being a little more economical, provided the quality is not compromised. Choosing a material that is of poor quality often leads to a not-so-good result, or worse, a disappointing one when you realize that it does not live up to your expectations. Aesthetics and functional appeal. Marble can come in a variety of colors and it is beautiful. However, appearance is not only the reason why many homeowners opt to choose marble for shower enclosures. Another good reason is that it can be used to create a custom shower enclosure, which means, you can make any size you want. In addition, Marble can also lasts longer than other type of materials. A high-end luxury material. Many people consider marble as a high-end luxury material. Meaning, by simply including a custom marble shower enclosure in your bathroom may increase the real estate value of your property as a whole. Even if you are not planning to sell your property soon, that is okay, your guests will surely notice the sophistication and the beauty of your unique marble-made shower enclosure, San Marcos CA. Marble is very easy to work with. This is another yet a good reason to choose marble. It is easy to work with because it is a softer stone that can be milled, machined and tumbled, which means it can have multiple uses. It can be custom designed according to your liking. Easy-to-maintain. Cleaning our bathroom, including the shower, can be a chore. However, with marble shower enclosure, there is nothing to worry about maintenance as cleaning is not an issue with this material. You bathroom will still be a place in your home that you want to frequent. Looking for the best material for your shower enclosure, San Marcos CA? Include marble in your list of prospects. Are you having a hard time choosing which type of material to use for your shower enclosure, Rancho Bernardo CA? Well, you might be interested with marble. When deciding which type of material to pick for bathroom renovation, it can be tempting to go for cheaper products. There is nothing wrong with that for as long as the quality is not compromised. Choosing a material that is of poor quality often leads to a less desirable result, or worse, a disappointing one when you realize that it does not live up to your expectations. Aesthetics and functional appeal. It can come in a variety of colors and it’s beautiful. However, appearance is not only the reason why many prefer marble shower enclosures; marble can be used to create a custom shower enclosure, which means, you can make any size you want. Marble can also lasts longer than other type of materials. A high-end luxury material. Many people recognize marble as a high-end luxury material. That means, by simply including a custom marble shower enclosure in your bathroom may increase your property’s real estate value. Even if you are not planning to sell your property soon, that is fine; your guests will surely notice the sophistication and the beauty of your unique shower enclosure, Rancho Bernardo CA. Marble is very easy to work with. This is another good reason to go for marble. It is easy to work with as it is a softer stone that can be milled, machined and tumbled, which means it can have multiple uses. It can be designed according to your liking. Easy-to-maintain. Let’s admit it, cleaning our bathroom, including the shower, can be a chore. There is nothing to worry about maintenance with the use of marble shower enclosure, as cleaning is not an issue with this material. You bathroom will be still be a place in your home that you want to frequent. Still looking for quality material for your shower enclosure, Rancho Bernardo CA? Include marble in your list. Contact Scandinavian Marble Design today.